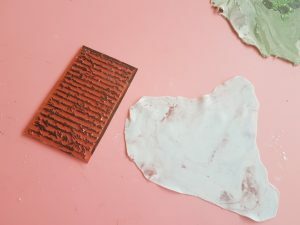 Textural, weathered fondant has become a huge trend for 2019, with brides opting for concrete and marble finishes. 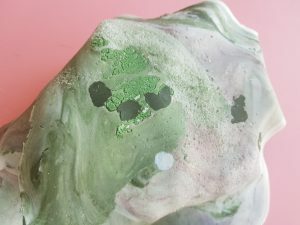 Inspired by the iconic play A Midsummer Night’s Dream by William Shakespeare, Priyanka Nayak shares a tutorial to create a romantic concrete-inspired mixed-media-effect fondant. 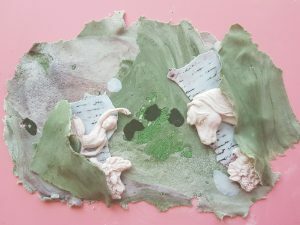 Mixed media: in vague terms this means using a variety of media (in this case edible media) to create a piece of art. 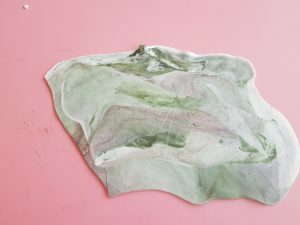 In the cake-decorating world, we are fortunate to have lots of exciting mediums at our disposal and layering these media can create interesting visual effects. We are all used to working with fondant but using fondant in combination with other products like wafer paper, royal icing, edible laces, isomalt, and edible fabrics can create beautiful textural finishes. 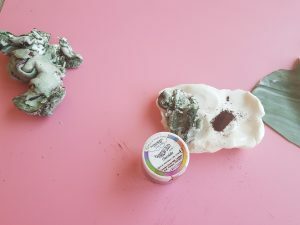 We can also use a variety of nontraditional edible products like dried fruits, sugars, semolina, chocolate chips, and nonpareils to add textural effects and dimension. 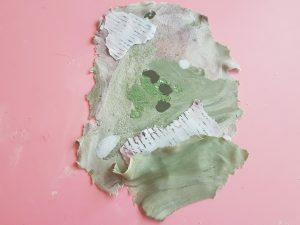 This tutorial is designed as an introduction to mixed media and serves as a platform for you to experiment on your own, testing your preferred mediums and methods to create edible art. In this case, I’ve selected a variety of media and tools to create an edible story: A Midsummer Night’s Dream. 1: The first step is to prepare the fondant, as some of the fondant will need to be aged or partially dried in advance. Simply marble several colors together and roll into a jagged ball. Leave the fondant to air dry for a minimum of 48 hours. This will allow the fondant to sufficiently crust. 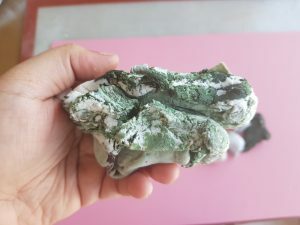 Prinyanka notes: Following the same aging process, also dry out some moss green fondant. 2: Tear off a section of the previously prepared, aged, marbled fondant and roll thinly. You should notice pieces of the crust poking through; this is exactly the effect we want to achieve. Set this fondant aside to dry again. This will allow you to tear the fondant into sections later. 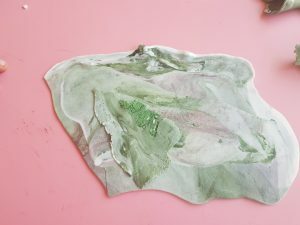 3: To create the base layer, knead a little brown dust, or cocoa powder, into a piece of fresh fondant and add a small piece of the aged, marbled fondant and a little of the aged green fondant. 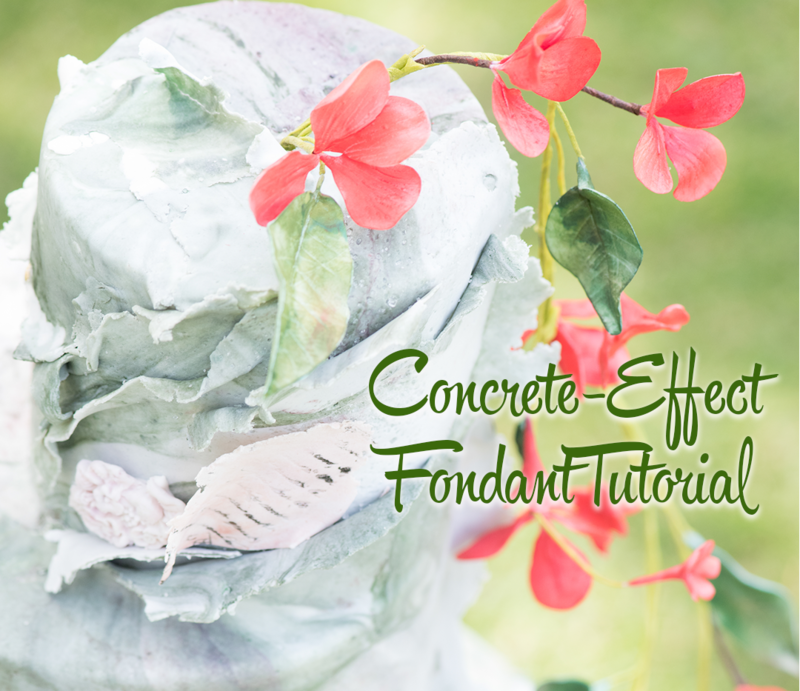 Roll out the fondant thinly to create a large panel. 4: Taking the piece of aged fondant you rolled out earlier, tear off sections of the fondant and adhere them to the fresh fondant base. Apply using a little water and roll over the pieces to merge them together. 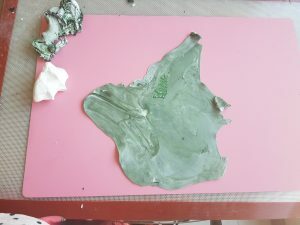 5: Add torn-up sections of the solid color fondant and marbled fondant in an impromptu pattern. Roll over the pieces to blend them into the layers below. 6: To add some further texture, sprinkle some white sugar onto the fondant as shown and press the sugar into the fondant to imprint the texture. 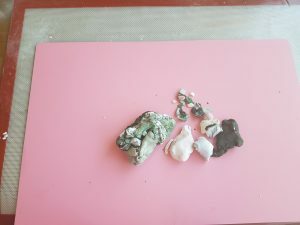 7: To create the calligraphy pieces, marble a small amount of black and pink fondant into some white fondant and roll as shown. 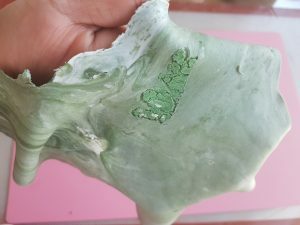 Next take a rubber stamp or a stencil and apply the pattern to the fondant by brushing with black gel color and stamping directly onto the fondant. 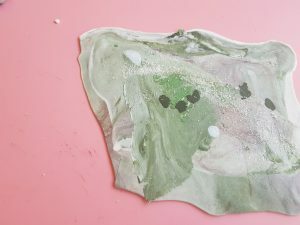 Leave this fondant to dry a little so that you can tear it into sections later. 8: To create the bas-relief mold work, choose a selection of molds. I used a unicorn (because I wanted a horse head), a ballerina, and I used a garden mold to tie in to the garden setting of the play. 9: Fill the molds with white fondant and place into the refrigerator for 10 minutes to firm up; this will make them easier to turn out. 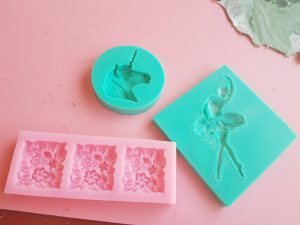 Priyanka notes: A good tip is to partially fill some of the molds so they feel more natural. 10: Tear some large pieces from the calligraphy fondant piece you prepared earlier and layer the sections onto the base layer. 11: Adhere the molded pieces to the fondant and add some further torn pieces of the marbled fondant over the top, making sure that the molded pieces are visibly protruding. 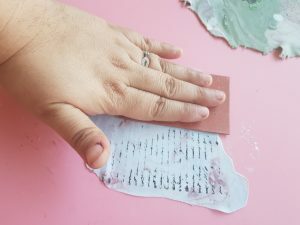 Priyanka notes: These mixed-media panels can be created directly on the cake or created separately and then applied in sections. 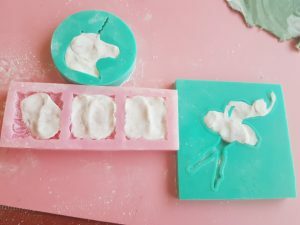 I prefer the second method as it allows you to really create a lot of dimension through layering and it’s easier to work with the fondant on a flat surface. Priyanka Arora Nayak is the owner of Polka Dots Cakes Academy in Mumbai, India. After a successful career in the experiential marketing industry, Priyanka’s desire to pursue creative passions led her to the world of cake decorating. After learning from some of the best artists in the industry, she decided to focus her talent on creating luxurious, gourmet cakes. Priyanka dedicates her time to creating wedding cakes and teaching sell-out classes that emphasize trends and visual balance. Priyanka is also the co-director of The Baker’s Collective, India’s premium residential baking convention.